Currently have created the following cannabis businesses: dispensary applications, cultivation and production applications, & distribution applications. Retail only dispensary license application are right around the corner in Nevada and have already added clients to assist with this project. Once more information is received about consumption lounges in the city of Las Vegas, we will be helping them write applications for this next "Green Rush" opportunity. Currently have created numerous SOPS for cannabis businesses, including productions plans and jurisdiction specific reports such as odor mitigation plans. Brand and product creation, marketing plans, running multiple sales teams, & two cannabis education companies to support your existing cannabis business. We are a Nevada focused company, with a comprehensive understanding of our current laws and government policies. Many businesses rely on our insight to help guide many of their long range planning. 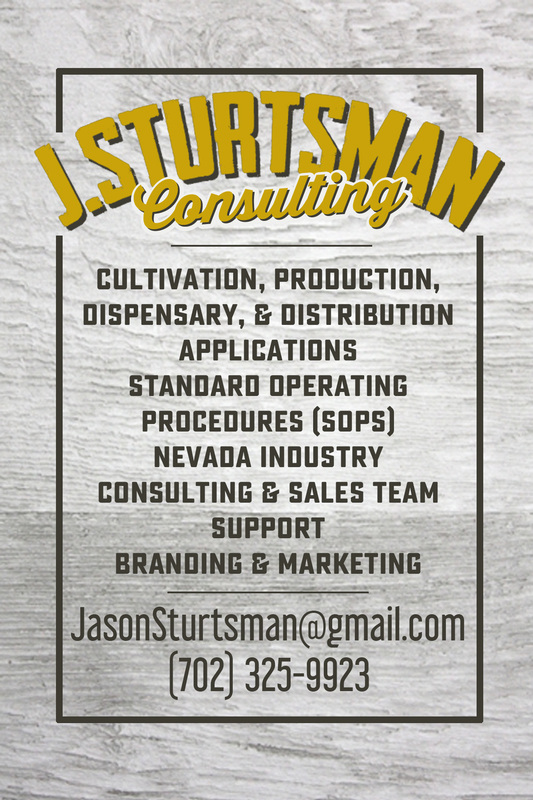 It is as easy as googling Jason Sturtsman, our CEO, to see that we are a respected member of the Nevada cannabis community, currently sitting on a Nevada government board called ILAC that advises the Nevada Department of Taxation, previously the Nevada Division for over 3 years.